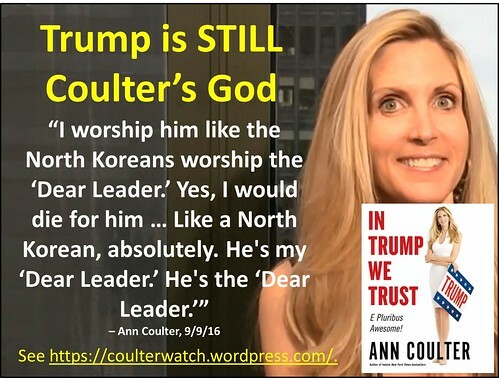 Nine months later, Coulter expanding her adoration for Trump, claiming that she would diefor him. Yes, she calls Trump “my” Dear Leader, then “the” Dear Leader, as if there could be no other. Hence her book title displacing God: In Trump We Trust. No matter who wins, DT or HRC, America LOSES. Liberalism no matter the party KILLS. Make no mistake. Tonight’s Trump victory is because people worship Trump and people are upset with non-whites. @BuckWheezer I voted FOR Liberty. @BuckWheezer I voted FOR The Constitution. @BuckWheezer I voted FOR The Bible and according to The Bible. @BuckWheezer I voted for the ONLY REAL Constitutional-Conservative in the race, who IS honest, intelligent, mature, SANE and a REAL Patriot. @BuckWheezer I voted FOR @Evan_McMullin . @Evan_McMullin Being Right does not always jive with the world. The world equates right to winning. @Evan_McMullin God equates Right to faithful obedience to HIS Word- Period. @Evan_McMullin Being Right in GOD’S eyes can mean being persecuted and imprisoned, even killed by those who ARE Wrong. @Evan_McMullin Dying for what/WHO IS Right in GOD’S eyes, IS winning. For me to live IS Christ, to dies IS GAIN. @Evan_McMullin No matter who is President- JESUS IS KING. No matter what the world calls winning- Christians NEVER LOSE. @Evan_McMullin I am disappointed as a Patriot and Citizen of the outcome of this election. The America I was born in IS dead. @Evan_McMullin So I grieve for those who hope and trust in man- I rejoice with those whose hope & trust is in The Lord Jesus Christ. @Evan_McMullin The Blood-bought Church of The Lord Jesus Christ awaits eternal glory in Heaven…pray all who are not ready GET READY. Three chances DT does ONE thing good/Constitutional: slim, fat and none. @Evan_McMullin Thus ends my election night twitter storm. The tweets will be presenting my findings from my Trump investigations in the order they were reported in @Newsweek. 1.Trump lied to Congress that he was not meeting with any Indian casino executives when documents and sworn statements show he was. 2.Trump testified under oath that he is willing to claim success on something even when he knows his claim is false. 3. Deutsche Bank concluded Trump net worth at $788 million when he was publicly claiming (and told bank) he was worth multiple billions. 4. Trump said under oath that he determines his net worth based on how he feels. 6. Trump’s first project, given to him by his dad, lost money, according to state records. Trump has publicly lied that it made money. 7. Trump’s second project was a Broadway show. It bombed, closing after 96 performances. He lost his investment. 11. When Trump built Taj Mahal, testified under oath to NJ he’d only use bank loans, not junk bonds. No bank would lend. Used junk bonds. 12. Trump’s 3 casinos all competed with each other, which is why no banks loans. Taj took business from his other 2 casinos, crippling all. 13. Trump spent huge sums on airline, promising top elegance. People w/ airline experience said it couldnt work. It never turned a profit. 14. After Trump’s top casino execs died in accident, Trump took over running them. Large numbers of execs quit because of his management. 19. Trump was $3.5 bill in debt. Later, when banks bailed him out, he claimed in books he was $9.5bill in debt to make recovery look better. 21. Trump admitted under oath that, when he claimed he was $9.5 bill in debt in his books, it was a lie and he knew it.